When I first listened to Lowell, it was on my laptop while visiting friends in Newcastle, so predictably what I heard was terrible. Tinny laptop speakers can make a pretty bad first impression. I’m so glad that I then made the effort to listen to this substantial EP, I Killed Sara V through decent headphones. Having previously collaborated with supergroup Apparatjik, this time Lowell is riding solo - as vocalist, producer, writer and instrumentalist. The lady’s got skills, which have been noted in Europe, as well as her homeland of Canada; playing Denmark’s Roskilde Festival in 2012, Parisian Club Silencio (owned by David Lynch) and opening for Danish legends The Raveonettes. What we have in Lowell is a musician who stays true to her art and doesn’t sell herself as a product, and clearly, it’s working. Title track ‘I Killed Sara V’ takes an insightful tone. The song starts with funeral synth, piano and haunting vocals. Perhaps this song is a tribute to the multiplicity of women’s lives; the lyrics speak of Lowell ending one of these. The second verse shifts into a slow contemporary R&B. The lyrics describe moving through every day life laced with the awareness of inequality. The song ends with bluesy piano and perfect time to reflect on our realities. 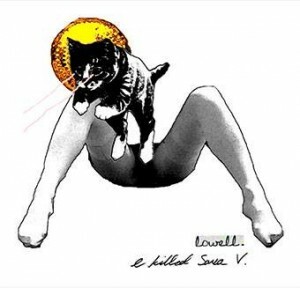 Lowell also created the video for single ‘Palm Trees’. It’s a psychedelic delight, where sensuality and intimacy matches this musical serenade of seasons. Elements of surf punk give the song movement. There’s nostalgia in the lyrics and Chan Marshall vocals. I love how Lowell layers the music, building until the stark piano ending lowers you gently to the close of the song. I Killed Sara V perfectly highlights Lowell’s virtuosity. This EP is on repeat in my household and I’d love it if she pays a visit to our shores soon. But for now, we had to satisfy ourselves with a quick Q&A. Can you describe your sound for us? At this exact moment I am listening to “Between Love and Hate” by The Strokes. How do you find the Toronto music scene for female musicians? Pretty weak. There are some bands with girls as back up singers? I hope most female singers do like trees and leave Canada to break so they don’t have to play ballads to please the critics. Canada has a very unique taste in music. Ahhhhh, but there was a time… Feist, Amy Milan, Peaches. I came back here for them. In your songwriting, what are some lyrics that are particularly meaningful for you? I’m not sure if any of my lyrics are meaningful. I wish I could remember. I’m constantly finding new meanings in my songs that I can relate to as time goes on. What may have possessed me to write one thing at one time may mean nothing to me now, so I have to change the meanings as I go on. ‘Cloud 69′ was once an expression of hormonal and bisexual angst. Now its a song of empowerment. Music must not stand still! ‘I Killed Sara V’ I only wrote a few months ago, so I suppose that entire song has a lot of meaning to me right now. Its an observation of my life as it was while I wrote the record and how I see it now. What was your inspiration for the ‘Palm Trees’ film clip? The weather. Definitely the weather. What was it like playing SXSW? Hectic and blurry. I had more shows than there were days, but they were all equally fun. My band and I ate a lot of tacos. This entry was posted in Music and tagged Canada, I Killed Sara V, interview, lip, lip mag, lipmag, Lowell, Musc, Palm Trees, q&a, Review, singer. Bookmark the permalink.